Immigrant rights advocates in Boston federal court Thursday argued the Trump administration’s cancellation of a humanitarian program for immigrants from Haiti, El Salvador and Honduras were decisions steeped in racism, and therefore, unconstitutional. 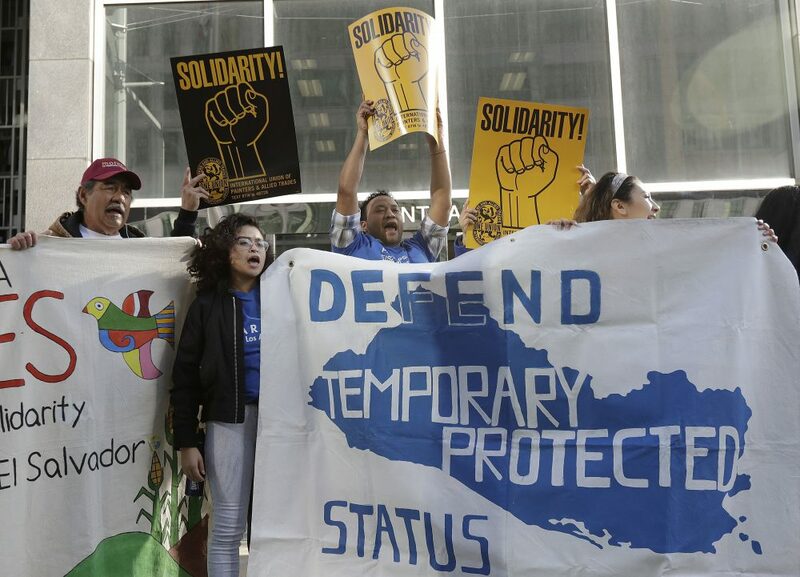 The lawsuit filed in February asked a federal judge to block Trump’s termination of Temporary Protected Status (TPS) for Haitians, Salvadorans and Hondurans, saying the government’s actions violate equal protection principles in the U.S. Constitution. TPS allows certain immigrants to live in the U.S. temporarily and without fear of deportation following natural disasters or amid civil war in their native countries. For Haiti and El Savlador, the designations were established after earthquakes in 2010 and 2001, respectively. Honduras was hit by a massive hurricane in 1998 that leveled the country. Iván Espinoza-Madrigal, executive director of the Lawyers’ Committee, pointed to previous comments from President Trump, including equating Latino immigrants with rapists and referring to Haiti as a “shithole” country. There are an estimated 10,000 TPS recipients from El Salvador, Haiti and Honduras living in Massachusetts and more than 400,000 living across the U.S. They are reported to have more than 200,000 U.S.-citizen children. The government is seeking to dismiss the lawsuit saying TPS protections are designed to be temporary. Furthermore, the government argues, the statute only allows the administration to evaluate country conditions related to the specific events that precipitated the establishment of a TPS designation in the first place. As the Trump White House has done with other immigration policy matters, the government is shifting the onus onto Congress in order change the TPS statute. But attorneys for the plaintiffs say past administrations have indeed taken more holistic views of country conditions when evaluating whether to renew a country’s TPS status. Lawyers said the Trump administration essentially created this new strict interpretation of its own accord. The courtroom was standing room only, and, at one point, Judge Denise Casper allowed people waiting outside the court room to come in and sit in the jury box. Casper said she would take all of the materials into consideration in making her decision on the government’s request to dismiss the case. The attorney for the government asked that, in the event the case does proceed, President Trump be removed as a defendant, stating that decisions on TPS are executed by the Department of Homeland Security.